Driving back home was just about the worst thing ever. I was starving, I had to pee, and we were stuck before the GW for about two hours. It’s just horrific when cars are not moving, there’s nothing you can do about it, and you’re physically uncomfortable. Ugh. But as soon as we got over the bridge, it was just fine. And we stopped at Fort Lee so I could cram food into my gullet. A had told us to stop in Fort Lee at this little takeout spot. She raved about it. She didn’t know what it was called, but it was on Main Street and right across from Parisienne bakery. After a few hiccups, we eventually found it. It’s called Picnic. It’s mainly a takeout spot, but there are a couple of tables and some counter space. It’s korean, chinese, and japanese bento type fare. There’s tons to choose from. There are a variety of different bento boxes that you can customize. 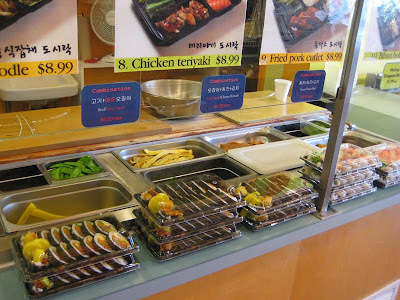 Tons of sushi and rolls and such, as well as some korean dishes. My mom went with the spicy stir fried squid bento box. 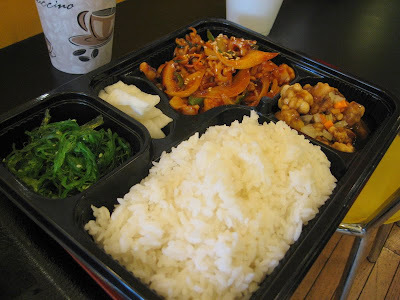 It also came with tangsuyuk (korean sweet and sour pork), seaweed salad, a bit of pickled radish, and of course, rice. Now normally, this stir fried squid dish is one of my most favorite of all korean dishes, but here, not so much. They put perilla leaves in it. And perilla leaves are just one of those things that I cannot stand. At all. It’s like how my mom hates cilantro. So it absolutely ruined this dish. Perilla leaves aren’t something that is normally used in this dish, so it puzzled me so as to why they would ruin this perfectly fine dish. Boo to picnic for taking something great and bastardizing it to nastiness. 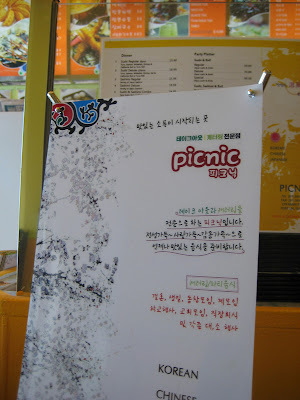 A had mentioned that the ddukbokki was very good here. It’s one of my favorite korean dishes, so I had to get it. It turned out to be only ok. 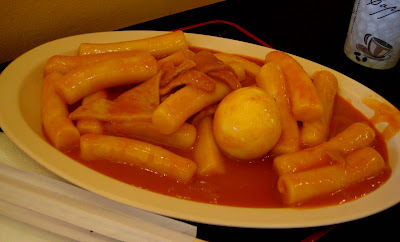 In fact, A has made me ddukbokki before, and hers is far superior to this one. She should go into business and hawk her ddukbokki! I would totally buy it. The picnic one I can take it or leave it. I mean since I was starving, I wolfed it down, but otherwise, I would not have really bothered. It was just missing something. All in all, this place did the job of filling our bellies, but neither of us was very impressed. I’ve had much better korean elsewhere.